Wharton Research Data Services, SSRN and Elsevier are pleased to announce Sam Houston State University, College of Business Administration as the winner of the first WRDS-SSRN Innovation Award™, honoring emerging business schools. Left to right: Mitchell Muehsam, Dean of College of Business Administration at Sam Houston State University, Harlan Sands, Vice Dean of Finance and Administration of the Wharton School, Gregg Gordon, Managing Director SSRN. Wharton Research Data Services (WRDS), the award-winning data research platform and business intelligence tool for corporate, academic and government institutions worldwide, announced (April 2017) a unique collaboration with SSRN, the world’s leading preprint server and working paper repository, and its parent company Elsevier, a global information analytics company specializing in science and health. The collaboration will elevate the visibility of universities and researchers conducting research across an array of financial and economic fields. The WRDS-SSRN Innovation Award is an important element of the collaboration. Three winners will be selected annually from across North America, Europe and Asia-Pacific regions based on their ability to demonstrate innovation and research excellence. Winners will receive a monetary prize and promotion. To learn more, go to http://www.whartonwrds.com/about/our-impact. 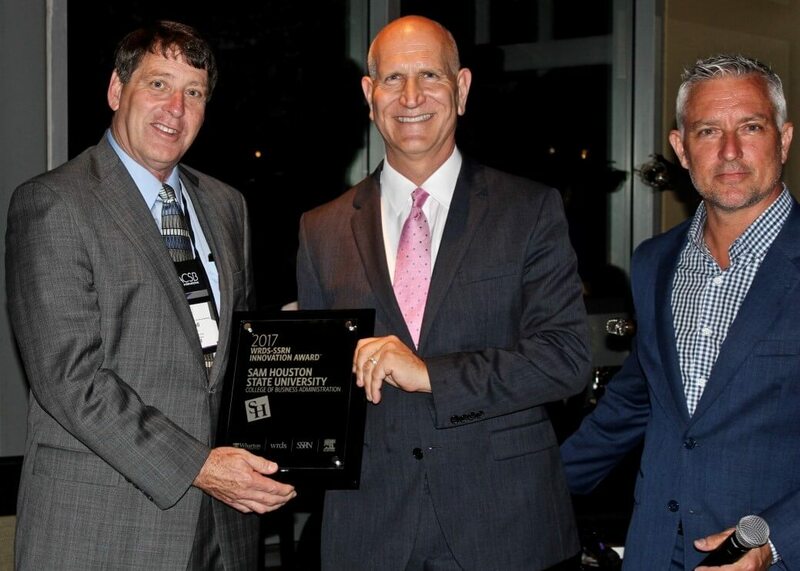 Mitchell Muehsam, Dean of College of Business Administration at Sam Houston State University, was presented with the award on Sunday (23 April, 2017) by Harlan Sands, Vice Dean of Finance and Administration of the Wharton School, and Gregg Gordon, Managing Director of SSRN, during a dinner event hosted by WRDS, S&P Global Market Intelligence, and CRSP. WRDS provides researchers with one location to access over 250 terabytes of data across multiple disciplines including Accounting, Banking, Economics, ESG, Finance, Healthcare, Insurance, Marketing, and Statistics. Flexible data delivery options include a powerful web query method that reduces research time, the WRDS Cloud for executing research and strategy development, and the WRDS client server using PCSAS, Matlab, and R. Our Analytics team, doctoral-level support and rigorous data review and validation give clients the confidence to tailor research within complex databases and create a wide range of reliable data models. An award-winning data research platform for over 50,000 commercial, academic, and government users in 30+ countries, WRDS is the global gold standard in data management and research ̶ all backed by the credibility and leadership of the Wharton School. Founded in 1881 as the first collegiate business school, the Wharton School of the University of Pennsylvania is recognized globally for intellectual leadership and ongoing innovation across every major discipline of business education. With a broad global community and one of the most published business school faculties, Wharton creates economic and social value around the world. The Wharton School has 5,000 undergraduate, MBA, executive MBA , and doctoral students; more than 9,000 participants in executive education programs annually and a powerful alumni network of 95,000 graduates. SSRN is a worldwide collaborative of over 330,600 authors and more than 2.2 million users that is devoted to the rapid worldwide dissemination of research. Founded in 1994, it is now composed of a number of specialized research networks. Each of SSRN's networks encourages the early distribution of research results by reviewing and distributing submitted abstracts and full text papers from scholars around the world. SSRN encourages readers to communicate directly with other subscribers and authors concerning their own and other's research. Through email abstract eJournals SSRN currently reaches over 400,000 people in approximately 140 different countries.